In this article we will look at swimming pool filtration; how it works and why it is so important. Filtering the water in your pool. Dust and debris fall into your pool water or are blown in by the wind or gets carried in by bathers. The job of the pool filtration system is to get that dirt out and helps leave your pool water sparkling and clear. Your pool has a circulation pump and a filter. The pump draws water from the pool and circulates it through the filter and also through the heating and treatment system, if you have one, before returning it to the pool again. The pump will also power your suction or pressure side cleaner if that is the pool cleaning system that you use. The most common form of filter uses sand although there are other types of media available, such as Glass or Zeolite. Cartridge filters are simple to maintain and are becoming more popular. DE or Diatomaceous Earth filters are able to remove finer particles than a sand filter but do require more maintenance, whereas Zeolite is also a very fine filtration substance and will remove combined chlorine and therefore the smell of chlorine that can be rather unpleasant. 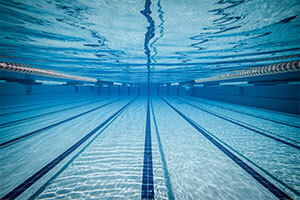 Under normal conditions the pool pump, and therefore filter, should be run between 8 and 12 hours a day. The pump will normally be on a timer so that regular filtration is maintained. The circulation of the pool water through the filter basket will take out leaves and other larger items. The filter will remove dirt and debris that is in suspension, but anything that has settled to the bottom of your pool or become attached to the sides will have to be vacuumed or brushed off. Adding a clarifier to the pool water will help the filter keep your pool water even cleaner by encouraging the finest particles to clump together so that they are more easily filtered out. Sand filters trap dust, dirt and fine particles of debris in a bed of sand and so, in time, they become clogged. The water can’t pass through the filter as easily as it should and the filter becomes less efficient in doing its job. Your pump will probably be fitted with a pressure gauge and when this rises to 0.5 bar above its normal clean operating pressure, then it’s time to backwash your filter. It’s good practice to backwash once a week at any event. Backwashing pushes water in the opposite direction through the filter and so the accumulated particles are cleaned out and sent out through the waste pipe. First turn the pump off and other equipment such as the heater then turn the filter setting to “backwash”. Turn on the pump and let it run until the water coming out of the waste pipe or that you can see flowing through the sight glass is clear. This generally needs a couple of minutes. Turn off the pump, set the filter to rinse to clean out the pipes and then run the pump again for 30 seconds. Set the filter to “closed” and close the suction valves. Open the leaf trap and remove the basket and clean it out. Replace the basket, set the filter to “filter” and turn your pump back to its operating position. For cartridge and DE filters the procedure is different but the instructions that you received from the manufacturer will explain what to do. The sand in your filter will need to be changed once every 3 to 5 years dependent on pool use. MultiCyclone pre-filters and Triogen UV water treatment. You backwash your filter in order to clean it. The more dirt and debris the filter collects, the more often you need to backwash, and backwashing increases the amount of water your pool uses and therefore the amount of chemicals that the pool uses. Anything that you can do to decrease that water usage will make your pool cheaper and more environmentally friendly to run. A MultiCyclone is a pre-filter that water passes through before it gets pumped into your filter. The unit creates a vortex that spins out dirt and debris and retains it in a sediment chamber that can be easily emptied using very little water. Less dirt gets to your pool’s main filter so it needs to be backwashed less. As much as 80% less. Triogen UV water treatment destroys organisms in your pool water by passing it through a chamber where it is dosed with UV light. The compact units have been designed for quick and easy fitting, so that installation is inexpensive. The main benefit of switching to UV disinfection is improved water quality, as the Triogen TR2 unit controls algae, chlorine-resistant organisms and other unwanted life forms without having any harmful residual effect or leaving any by-product in the water. This highly efficient design reduces the amount of water used during backwashing by up to 30%.